Imagine a steady stream of immigrants, traveling across a vast ocean to a foreign country, searching for new jobs and better lives. But the immigrants are Americans, and the country they are moving to… is China. 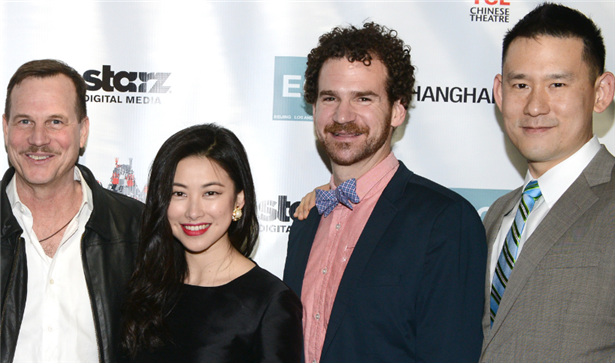 Shanghai Calling is a romantic comedy about modern-day American immigrants in an unfamiliar land — China. An ambitious New York attorney, Sam, is transferred to Shanghai on assignment, partially because he's Chinese-American. A fish-out-of-water, he stumbles into a legal mess that could spell the end of his career. With help from a beautiful relocation specialist, a well-connected foreign businessman, a clever but unassuming journalist, and a street-smart assistant, Sam might just save his job, discover romance, and learn to appreciate the many wonders Shanghai has to offer. This is a capsule synopsis of Daniel Hsia’s uniquely beguiling new film, Shanghai Calling, that I was fortunate to attend at its Hollywood premiere last night at the TCL Chinese 6 Theaters with members of the cast and crew present. Last week I was also lucky to catch a sneak preview of Shanghai Calling at USC, where Daniel Hsia once studied. The film’s prolific producer, Janet Yang, was on hand for discussion, and below are some of her remarks about the film and co-production work between the US and China today. Janet Yang, who took on Daniel Hsia’s debut as a feature film writer-director with Shanghai Calling, is an accomplished Hollywood producer with a long, deep relation­ship with China. Yang produced the acclaimed drama Dark Mat­ter, starring Meryl Streep and Chinese star Liu Ye, which premiered at the 2007 Sundance Film Festival and won the prestigious Alfred P. Sloan Prize for Best Narrative Feature. She also produced Carl Franklin’s High Crimes, a military courtroom thriller starring Ashley Judd and Morgan Freeman and The Weight of Water, directed by Academy Award® win­ner Kathryn Bigelow and starring Oscar® -winning actor Sean Penn; and Zero Effect, a cult classic starring Bill Pullman and Ben Stiller. From 1989 to 1996, Yang served as president of Ixtlan Corporation, the company she formed with Oscar-winning filmmaker Oliver Stone. At Ixtlan, she produced Milos Forman’s The People vs. Larry Flynt, which won Golden Globes for Best Director and Best Screenplay. The film also garnered Academy Award nominations for Best Director and Best Actor. Yang was also executive producer of Wayne Wang’s groundbreaking film The Joy Luck Club, based on the bestselling novel by Amy Tan. Prior to her association with Oliver Stone, Yang worked with Steven Spielberg and Amblin Entertainment on their historic production of Empire of the Sun, which filmed in China. Yang began her career in Hollywood when she represented Universal, Paramount and MGM/ UA in brokering the first sale of American studio films to China since 1949. Before joining MCA/Uni­versal, Yang served as the president of World Entertainment. During this time, she gained the distri­bution rights to films produced in mainland China, including those of such internationally prominent filmmakers as Yimou Zhang and Kaige Chen. What attracted you to producing this film? For years I've wanted to produce a film about contemporary China; I've been there quite a bit. There's a lot about China in the press, but people's understanding of China today can be quite shallow. I wanted to show a China that was more colorful and more human. This film was a co-production with China. Was there anything that the Chinese producers found objectionable? Well Daniel has a comedy background. At the same time, I thought it was really important that this film be authentic, so I put my radar out for anything that might seem offensive, or funny at the expense of the Chinese. For example, originally there was a squat toilet in Sam's apartment. But this wasn't really credible for a character like Sam. And I wanted to show a China of today, one more modern. The script was vetted many times, on both sides of the Pacific. For example, in Sam's imagination of China at the outset of the film, he sees a chicken and a peasant setting. But his picture changes. And everyone in the film is quite likable, so you see the overall intent as making fun of a situation, and not a people. How does the vetting work in China? First you must submit your script, and second, you must submit your film. (And as you submit your film, you know someone in China may be pirating it.) They approved our script with very little fuss. "Be careful of this and this," they said. 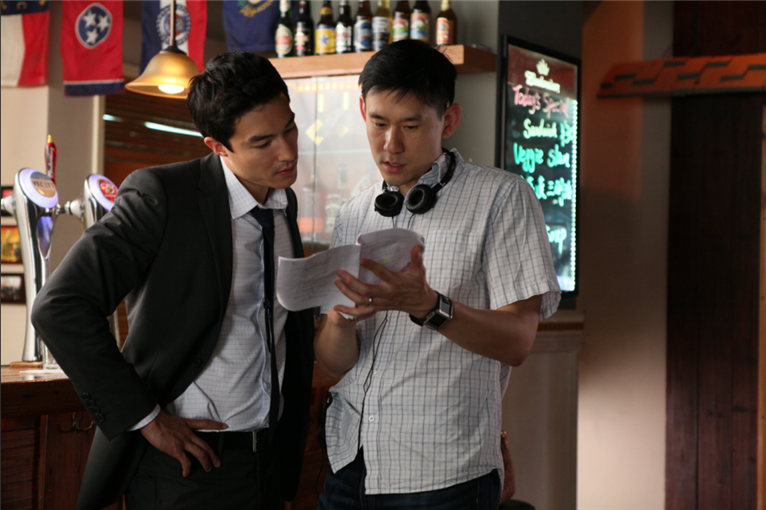 Then when we submitted the film, they asked us to cut some length from the chase scene with Daniel Henney. That was all, and it was not a problem. Why was Daniel Henney cast in the lead? Well maybe we could have gotten more financial leverage with a big-name Chinese American actor, but Daniel Henney appeals to everyone. You've seen the film — he's HOT! Even though he's been in a lot of film and television in Korea, he had never done any comedy before. And the people in China were behind him. Do Asian American actors see better roles coming their way in China? For Asian American male actors, China is offering more opportunities than here. Daniel Henney is now making another film in China. Why are there so few good Asian American film roles today? There are not enough good stories, but also, maybe not enough inspiration to write them. Americans can be very provincial about culture. But China does have these roles. What were the particular challenges for you in working on Shanghai Calling? This film needed a producer who was bi-lingual, who could work with a cross-cultural crew, and who understood the different working styles of China and the U.S. Funny issues were coming up on the set every day. It's the fourth time I've worked in Shanghai. Most of the good companies are independent contractors. In Empire of the Sun we had 5,000 extras. This time we had more work to do, but more control in the end. We brought over a director of photography, an editor, and an accountant, and that's it. All the rest were there in Shanghai. 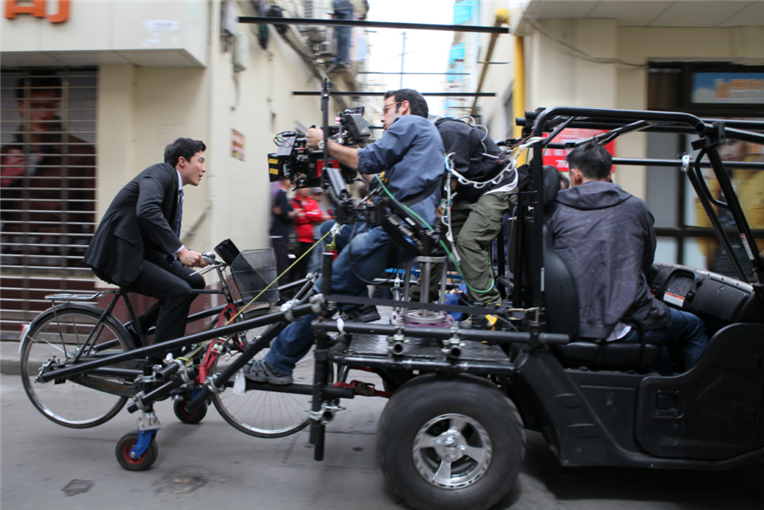 We shot for thirty days, all over Shanghai -- there were no sets; it was all location shooting. Eliza Coupe, who plays Amanda, came in at the tail end of casting and then had to learn Chinese in two weeks! We found so many Western actors living and working in Shanghai. The older I get, the more I enjoy breaking rules, because the rules don't work, anyway. How many hours per day did you shoot? Technically, we could have shot 24 hours! There's no union there. And they work seven days a week. Because we had SAG actors (covered by the Screen Actors Guild), we shot for the normal number of hours per day, and six days a week, for thirty days. Has Shanghai Calling been shown in China yet? It was shown at the Shanghai International Film Festival in June, where it won two awards, one for the director, Daniel Hsia, for Best Screenwriter, and one for the lead, Daniel Henney, for Best New Actor. Then the China Film Group opened it right away last summer, and it's been selling like hotcakes in the video shops in China — legally! How did you come up with the budget for the film? One of the challenges of making films in China is the financing. There are no financial incentives going into the production. For example, there are no tax breaks. This movie didn't cost us a lot of money to make it, so we'll be okay. Lately lots of people want to make movies in China because of the big box office. If you do a co-production, as we did, you can open on Chinese holidays when American films can't, and also you get a much higher box office split. After some initial private investors here, we got money from China. We decided to go with China Film Group. It wasn't quite a 50/50 split — not yet. How is the film market different in China? There are actually lots of multiplex cinemas now in Shanghai. They are digitized, and modern, and there are more and more of them. The marketing is not so different from the way we do it here. They have commercials on TV, red carpets, and BIG press conferences. They pay their journalists to come to press conferences! What are Chinese audiences like today? Chinese audiences are very sophisticated and very hungry for films. And the country offers lots of stories and locations and faces. I really feel there is a growing need to understand China — its culture, its taste, and what Chinese audiences want to see. Shanghai Calling feels like an American movie, but it has Chinese content. It was an experiment. If you were making this film for an exclusively Chinese audience, how would it be different? Sam would end up with a Chinese girl, and the lead would be Awesome Wang. Was Awesome Wang always with that size of a role? I want more of him! You can go to our website and buy the T-shirt -- it says, "I AM AUSTIN WANG." He's based on an old British detective in China, and he got switched to a Chinese character. On Demand and Digital Download today!